This past weekend I attended the annual New York Ceramics Fair, held for the first time in the ballroom of the Bohemian National Hall, a beautiful Renaissance Revival style building from 1895, gorgeously renovated in 2008 with a striking modern interior. I enjoyed seeing dealers I had met during past visits to the UK, as well as making new acquaintances with other knowledgeable and friendly vendors. 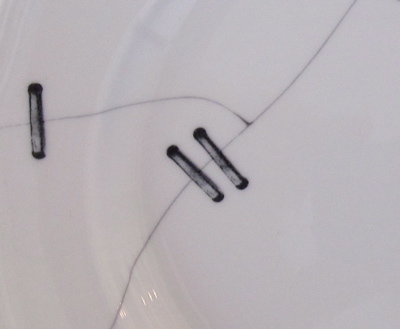 Most were curious about my “unusual” interest in repaired ceramics & glassware but were happy to share their thoughts and insight with me. Although, I was a bit taken a back by an American dealer who was less than friendly when asked if she had any pieces with early repairs. It seems I unintentionally offended her by implying that she might be selling less than perfect goods, which I certainly was not. 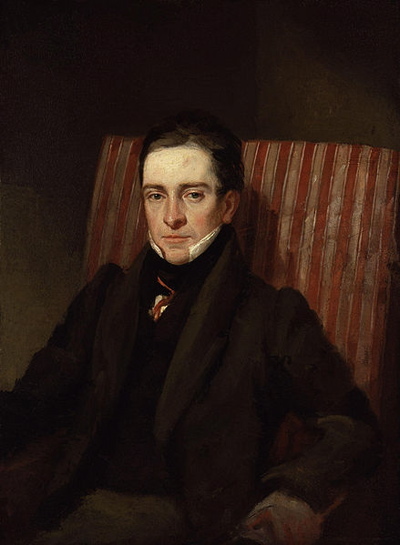 John Howard brought a magnificent and rare model of Wellington on his horse Copenhagen. 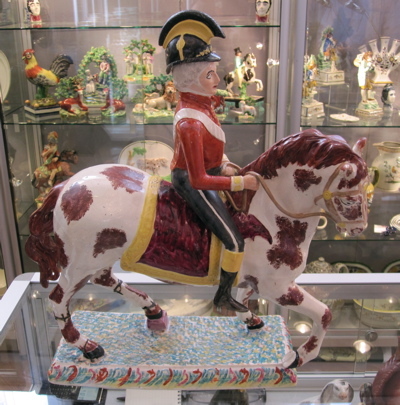 Towering at over 19″ high, this is probably the largest pottery figure made of Wellington from the Staffordshire potters just after the Battle of Waterloo, c.1815. 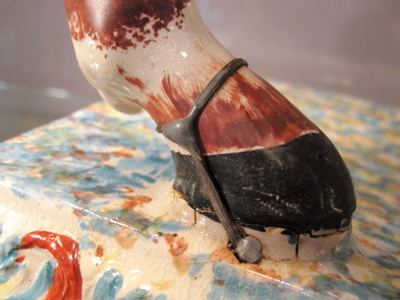 There are old tinker repairs to the legs which were made some 150 years ago. 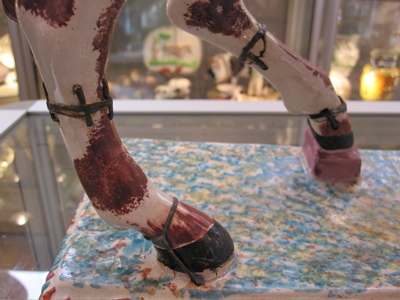 An actual horse with broken legs would certainly have been sent to the glue factory. 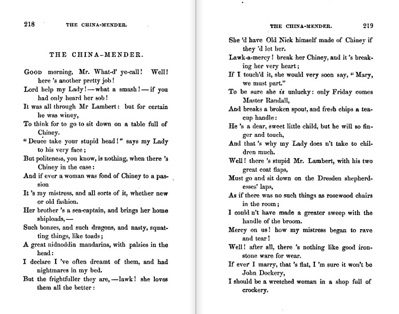 And perhaps the glue would have been used to mend broken pottery pieces. 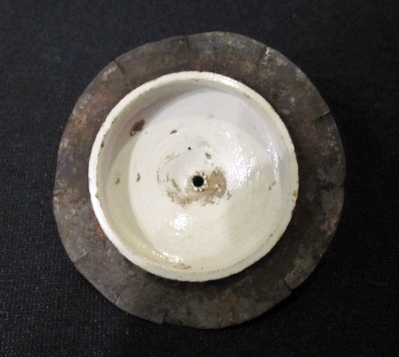 Simon Westman, a dealer from Grays in London, brought with him two different ceramic items with inventive repairs. 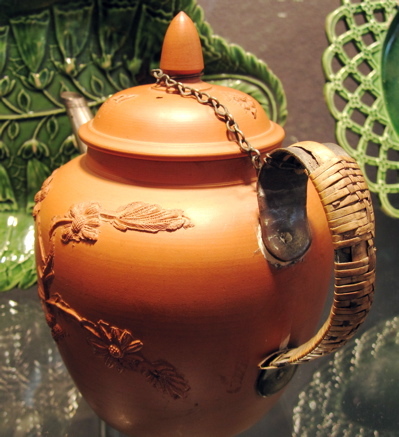 A small pearlware jug decorated in Pratt colors with a tin replacement handle from Staffordshire, c.1800. 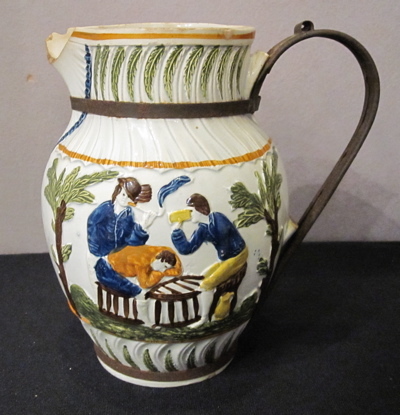 This jug and repair is similar to my own “Sailor’s Farewell & Return” jug, also with a chipped spout in the same location. Remains of the broken handle extend over the top of the replaced metal handle. 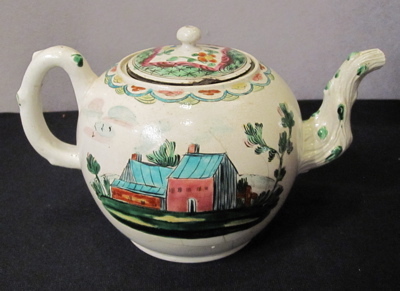 This saltglazed stoneware teapot with wonderful enamelled decoration was made in Staffordshire, c.1760. 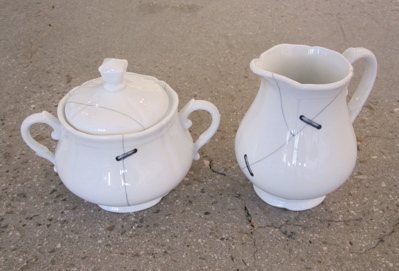 The replacement lid is from a teapot of the same material and period, with an added metal flange to make for a tighter fit. 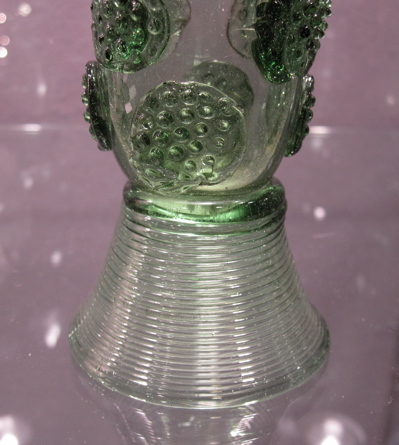 An unusual blown glass roemer from the Netherlands, dated 1662, was shown by Christopher Sheppard, also from London. 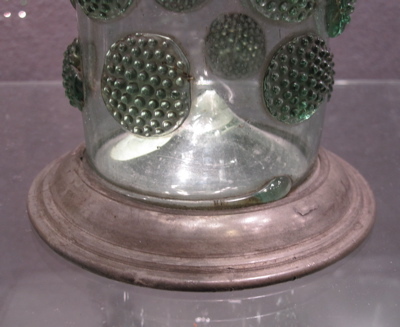 A 19th century pewter base replaces the original ribbed foot, which would have been built up out of glass threads. 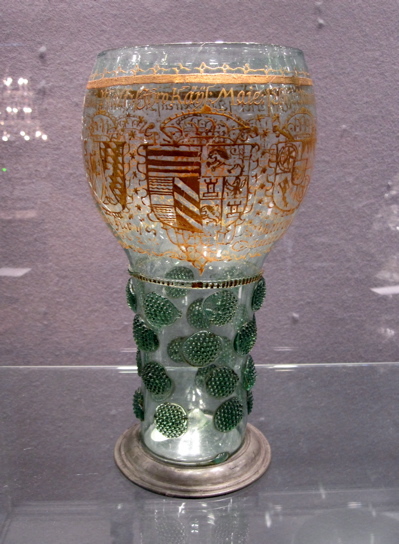 This is what the original glass base might have looked like. 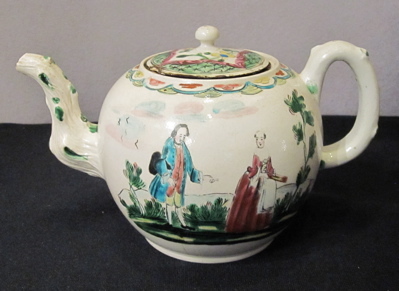 An English redware teapot c.1695, courtesy of Garry Atkins, has two inventive repairs. 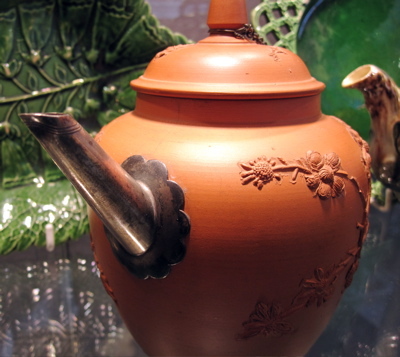 A silver replacement spout with scalloped decoration stands in place of the long lost redware original. 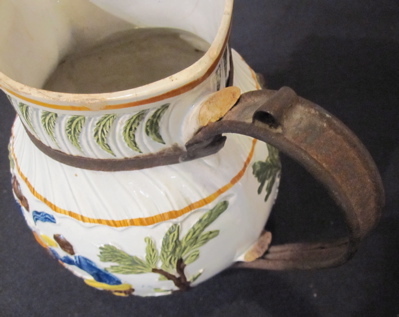 The broken handle has been replaced with a rattan-covered bronze handle, well over 150 years ago. 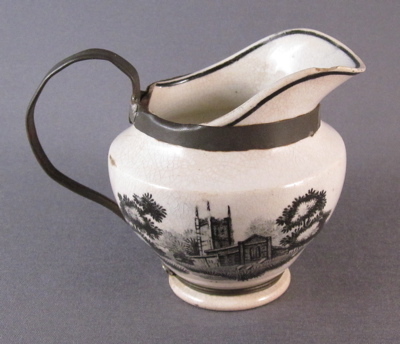 This diminutive cream colored pearlware pottery cream jug was part of a larger child’s tea set and was made in England in the first part of the nineteenth century. 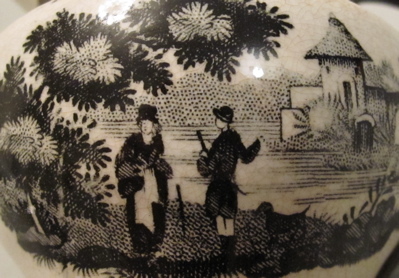 It is decorated with a bat printed black transfer pastoral scene, which may have been inspired by an engraving from the same period. 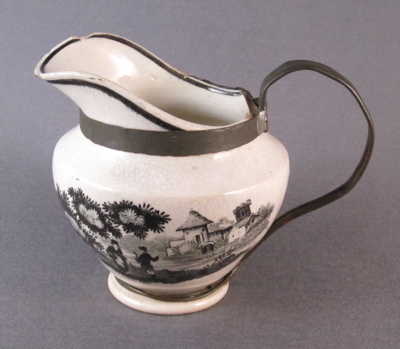 Cream jug measures 2-3/4″ high. 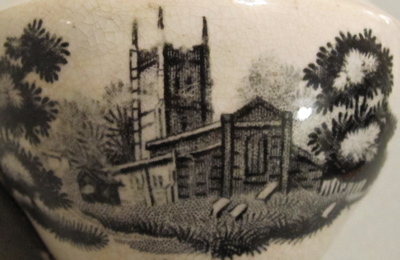 The other side is decorated with a church scene with what appears to be fallen tombstones. 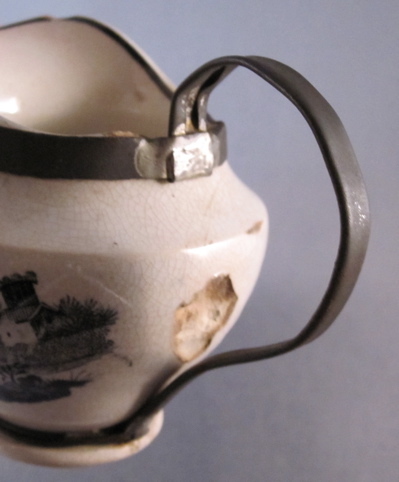 The crudely made metal replacement handle has crimped edges and a flat strap at the top, with a wrapped wire band at the base. 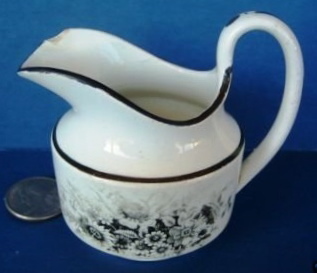 Another early child’s creamer from the early 1800’s is shown with its handle intact. 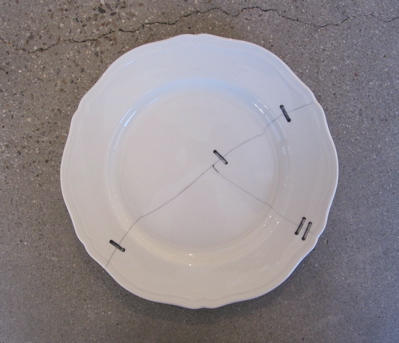 Dinner plate measures 10-1/2″ in diameter. 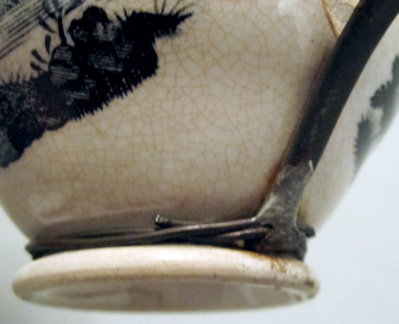 The trompe l’oeil staples and cracks look truly convincing even upon close inspection. 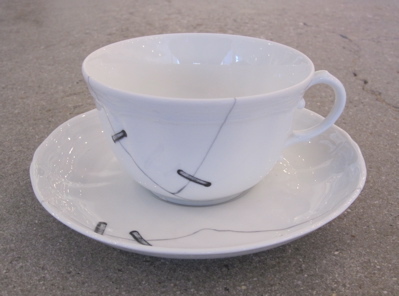 “Cracked” teacup, guaranteed not to leak, and matching saucer. 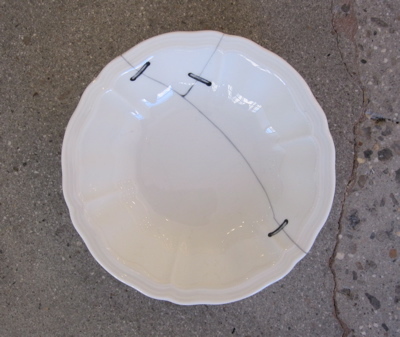 Soup plate, broken in three places, is held together with three staples. Or is it? 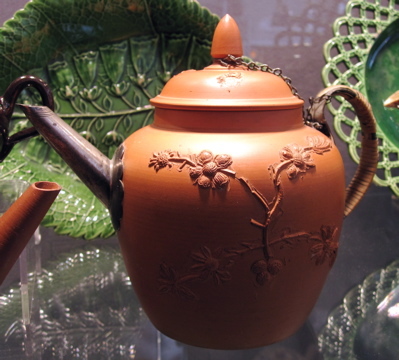 Sugar bowl and milk pot from the tea service.